The Muslim Brotherhood-led National Alliance to Support Legitimacy (NASL) has called for protests all over Egypt's major public squares on Tuesday to object to ousted president Mubarak's acquittal from killing protesters during the days leading up to his resignation and corruption charges earlier this week. In a statement issued on Monday the NASL called on the public to protest in a million person demonstration throughout Egypt to defend the rights of the 25 January revolution martyrs and to object Mubarak's acquittal. But although much of the public and pro-revolutionary forces have demonstrated against Mubarak’s acquittal, they seem unwilling to cooperate with Brotherhood supporters. During a popular protest in response to the Mubarak verdict on Saturday, demonstrators rejected the participation of Brotherhood supporters. Different Egyptian revolutionary political forces and parties including April 6 Youth movement and Constitution party have also declared their refusal to cooperate with the Brotherhood or the NASL following Mubarak's acquittal. 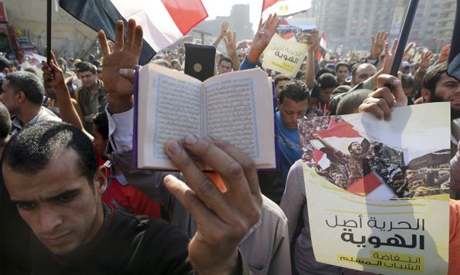 Tuesday's planned protest is part of revolutionary protesting activities launched by the NASL this week which the Islamist alliance called the "God is great..One hand" week. Tahrir Square has closed off intermittently since Friday as a result of demonstrations over the past week by Pro-Brotherhood forces seeking to assert an Islamic identity and pro-revolutionary forces protesting Mubarak’s acquittal. The NASL usually stages many small separate demonstrations in narrow streets across Egyptian cities to avoid clashes with the police. Last Friday the Muslim Brotherhood and its allies, including the NASL failed to mobilise protesters across the country in the "Muslim Youth Uprising" protests planned to restore to "restore the Islamic identity of Egypt" in response intensive security measurements taken by the government. At least two were killed and 224 arrested throughout Egypt in clashes with security forces on Friday. The Muslim Brotherhood was designated as a terrorist organisation in Egypt last December. Many of its leading figures and members including its supreme leader Mohamed Badie and former president Mohamed Morsi have been arrested and standing trial over the past year. The last march was such a " success"... Why not ask for two million men march... We all could use a good laugh. Will be a nice event to round up what ever is left of the Muslim brotherhood terrorists.